Even though we ate a lot of beets when I was a child, I’d never had borscht, until I was in my 20s. The story of that first borscht is one of my favorite memories. I’d taken the bus from Portland to Spokane, on the way to visit my Mom in Montana. The bus route from Spokane to the Flathead was horrible, so Mom agreed to drive to Spokane to pick me up. It was November. As we pulled out of Spokane it started to snow, and by the time we got to Coeur d’Alene, Idaho, it was beginning to be a blizzard. Mom didn’t want to cross 4th of July pass in the bad weather, so I suggested we turn north to Sandpoint and spend the night with my college friend, Heidi. So we pulled into a gas station and I called Heidi to let her know we were on our way, and to get instructions to her house out in the country. Mom and I walked over to her stove and peered into the pot through the steam. It was as red as a bowl of rubies, and the smell was heavenly. That was the most wonderful dinner. She put a dollop of sour cream on each of our bowls of borscht, and served the bread with homemade butter from her own cow’s cream. We forgot about that blizzard outside. We forgot about the frozen roads. Our hearts melted as the soup warmed us from inside out. Crimean Borscht, made with chunks of beef or wild game in addition to the veggies. My favorite is the latter, and is the recipe I present here, adapted from Soup, by Coralie Castle. The vegetarian suggestions are from the Vegetarian Epicure by Anna Thomas, and is the version Heidi served. 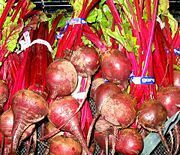 Most borscht includes other root veggies besides beets; most commonly carrots, turnips or rutabagas, parsnips, potatoes and onion. Cabbage is also a common ingredient. All of these veggies will keep through the winter in cold storage. This recipe serves 6 – 10 people. I usually freeze half for future. I like to make up an extra big batch of the broth and freeze half for future use, then make borscht with the other half. In this case, after searing meat and sauteeing the veggies, I remove all and deglaze the pan with 1/2 cup red wine. Then add all back to the pan and simmer. Long marrow bones can be hard to come by. As a substitute, you can use oxtail or short ribs (with the ribs). And stew meat is a good substitute for brisket. For a different flavor, slice a granny smith apple and add with the beets and veggies. Use 1 1/2 – 2 quarts Potato Peel Broth instead of the beefy broth described here. You can also add 1/2 pound dried black mushrooms when you start the potato peel broth, for a woodsy flavor. If desired, sear beef and bones in hot lard until brown. Turn heat to lowest setting and use a simmer plate if necessary. Cover pot and let meat sweat about 20 minutes, then remove to a bowl or plate. (Sweating increases the intensity of the beef flavor). In same pot, saute parsley, chopped and sliced veggies, and salt pork (if using) in butter or lard until golden. Add beef, water and seasonings. Cover; bring to a boil, and skim. Simmer for 2 hours or longer, as necessary for meat to be tender. (the longer you cook it, the more marrow from the bones). Strain off broth. Reserve meat, remove from bones and and dice; set aside. Compost the veggies. 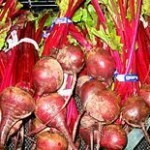 Bring stock/broth to boil, add beets, carrot, potatoes, rutabagas or turnips, and optional parsnips. Simmer 10 minutes. Add cabbage and reserved meat. Bring to boil and cook 5 minutes. Add seasonings, and adjust to taste. Serve, adding a dollop of sour cream to each bowl and sprinkling with a generous amount of dill. Serve with a hearty rye or black bread and plenty of butter. This entry was posted in Alcohol, Beef, Buffalo, Dairy, Fungi, Herbs, Onion family, Root Veggie, Sauteed, Simmered and tagged bay, beef, beet, cabbage, carrot, leek, onion, parsley, parsnip, potato, rutabaga, sauteed, simmered, turnip. Bookmark the permalink.